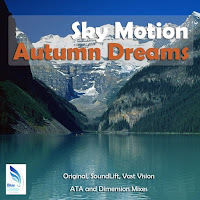 My 10 September 2010 Friday Trance Track of the Week is "Autumn Dreams" (ATA Remix) by Sky Motion (Robbie Seed). Click the artwork (at left) to preview the release at Beatport. Listen to the complete ATA Remix at YouTube. And here is a description of the release at DJ Tunes.